The Group, Inc. has a habit of bucking ordinary organizational structures on its path to cultivating employee investment and satisfaction in ways that directly benefit clients. In more than 40 years of serving the Northern Colorado community, our employee-owned company has always put relationships before numbers, believing strongly that fostering the right human capital is the best way to build both profits and longevity. That perspective filters into an unusual management philosophy that keeps The Group’s Partners on the cutting edge of the industry and ensures they have the time and knowledge to do the best job for their customers. Unlike most real estate companies, The Group’s five managers don’t compete with Selling Partners, and they never have. And the approach works. The real estate industry as a whole sees 80% attrition within the first two years. But The Group turns that number on its head, with more than two-thirds of its brokers sticking around for much longer than those first two years. A lot of that comes back to the team-oriented perspective that dominates The Group’s management philosophy and creates a special dynamic that’s good for everyone involved. In short, managers play two roles. The first is fairly typical: Managing Partners make sure the offices run as seamlessly as possible and Selling Partners have the support they need. The second—in which Managing Partners fill a coaching role, pushing Selling Partners to set and achieve both personal and business goals—is far from the industry norm. Ultimately, the model fosters trust, ensures managers are available and maintains a company culture in which people support one another. Keep reading to find out what our managers have to say about it. Susan Orth has been with The Group for 25 years and now serves as Employing Broker. In addition to overseeing 52 sales Partners, she holds all the company licenses under her name, delegates responsibilities for the offices, and makes sure all transactions are in compliance with the Colorado Real Estate Commission rules. “Non-competing management is crucial for our culture and for the success of our company. I think that being available to the salespeople and not competing with them fosters trust—they’re not thinking that I’m looking out for my business versus their business—and availability. I’m not out working on my own business. I’m here for them pretty much 7 days a week,” Orth says. There is a lot of flexibility in how the relationships between Managing Partners and Selling Partners play out. Rookies, who have been with The Group for 2 years or less, must meet with their managers once per week. After that, meetings can occur weekly, monthly, or even quarterly depending on the broker’s wants and needs. Cass and the other managers help their Selling Partners manage their time, monitor their numbers, and most importantly, work toward their “wildly important goals,” whether those are work or personal. A central philosophy at The Group is to put people first in order to meet business goals. Therefore, relationships are just as important among Managing Partners as between Managing and Selling Partners. 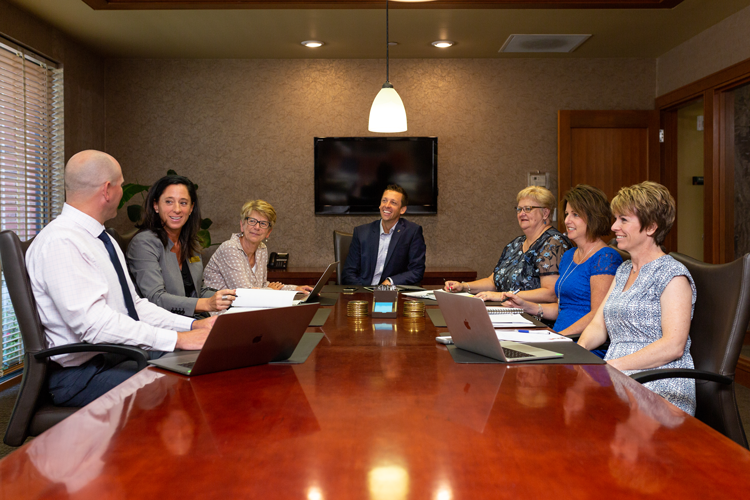 The team of Managing Partners meets weekly to talk about their office’s goals and accomplishments and pool their skills to ensure brokers have access to a wealth of knowledge and resources. The Selling Partners, in turn, know that they can consult with any manager on the team. Because Managing Partners aren’t spending time selling, they are available as a resource to their Selling Partners. But that’s not just about having the time to meet with brokers. It’s about being able to constantly improve their knowledge of the real estate market and industry. “I know that I have to keep my skills sharp because people are going to come in and ask me about properties and neighborhoods. That helps me because I’m more in tune to go out and tour houses, keep up with everything that’s going on. As a management team, it really helps us because we know that those sales Partners are relying on us if they’re struggling or need information,” says Ewing. For most of the Managing Partners, moving into this position felt like a natural progression. Some came to real estate with management backgrounds while others worked their way around the industry and bring that diverse experience to bear. But all of The Group’s Managing Partners take pride in the fact that the job, like the company itself, gives them a chance to be part of a bigger network of like-minded people. Please reach out to our team directly if you have any questions. You can find our contact information here.